DON’T expect the CO2-centric mainstream media to report on this latest study of dramatic “greening” of the planet thanks to CO2 fertilisation. When you’re in the business of demonising carbon dioxide for political ends, such good news comes as a rather unwelcome message. Although it is still 3-4 days away, rapidly strengthening Hurricane Florence is increasing the threat of a major hurricane landfall somewhere within 120 miles or so of Wilmington, NC. If it reaches that area as a Cat 4 storm, the damage produced will be extensive, likely amounting to tens of billions of dollars. 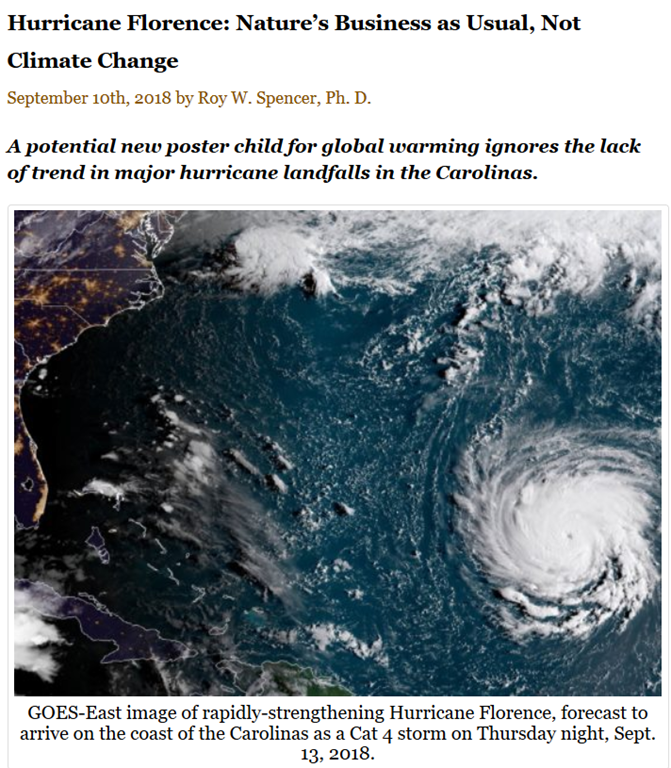 By coincidence, the hurricane disaster (if it unfolds) will occur during this year’s Global Climate Action Summit (Sept. 12-14) in San Francisco, possibly the most star-studded climate alarmist extravaganza in existence, with climate experts such as Al Gore, Alec Baldwin, Andrea Mitchell, Catherine McKenna, Dave Matthews, Jane Goodall, John Kerry, and Tom Steyer. As we all know, these are people who lead by example in their efforts to reduce their so-called carbon footprints.